A group of environmental volunteers is cleaning up some of the remotest beaches in the UK. They have travelled to the Isles of Scilly from Cornwall on a converted fishing boat and are targeting hard to reach coves on uninhabited islands. They also have permission to visit some islands that are usually off limits within the Area of Outstanding Natural Beauty. Over two weeks the group expects to collect about eight tons of waste. Steve Green from Clean Ocean Sailing, which organised the trip, said: "When you look from a distance it looks like paradise with pristine beaches, but in just a few hours we have filled up three dumpy bags with rubbish that has washed up." The Isles of Scilly Wildlife Trust (IOSWT) is responsible for many of the islands, and has asked the group to visit certain areas over a 14-day period which began last week. The Trust organises beach cleans regularly, and cleared four tons from easier to reach beaches last year. But many areas are difficult to access. Nikki Banfield from the IOSWT said: "We appreciate the help that volunteer groups such as Clean Ocean Sailing can offer in a time where public awareness is increasing and people outside of our islands are gaining a better understanding of the plight of our oceans." The rubbish is loaded onto the deck of the Blue Linnett, an 81-year-old herring drifter, and is taken back to the mainland where much of it is recycled into kayaks. "We think we can manage about eight tons over the fortnight - the boat will be very full," Mr Green said. The crew includes students, retirees and people on career breaks. The team comes from Holland, France and the UK. Erik d'Ailly, 63, is a retired journalist from Amsterdam and explained why he wanted to get involved. "I don't think most people have any idea where their plastic winds up," he said. "When you walk around here, and every other step, you stand on a bottle, it tears you up. "It's not only damaging for marine life, but also for us too. I mean we eat fish. If we check out what is inside our bodies now, there are pieces of plastic in it, and you don't want that." French student Emma Eberhardt, 20, said: "Plastic is a massive problem and this is a bit that I can do to help." Tean is among the islands that the group is tackling. The uninhabited island is about 500m long with a perfect horseshoe shaped beach filling much of a southern shore that the team spent a few hours clearing. A thick layer of crispy brown seaweed has been left at the top of the beach by recent big tides, and within the seaweed huge amounts of plastic is entwined. The group find bottle tops, bits of fishing rope, wire, food wrappers, deodorant cans and other unidentifiable pieces of plastic. There is an 85 litre plastic water carrier, a piece of 30cm diameter black tubing that is nearly two metres long. There are crates, dozens of two litre plastic bottles, pots and countless pieces of fishing gear. The team inches along the beach, scooping up all the pieces they can, transferring them into reusable shopping bags until they are full. They then deposit their haul into a builders's bag. Many of the items have markings indicating they may have drifted over huge distances, including Canada, Ireland, Spain, Russia and Japan. 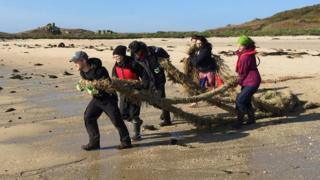 Further along the beach, the group find two enormous ropes that are likely to have been used to tether large ships. They are so large it takes six people to drag them down the beach, and a monumental effort to haul them into the dinghy, and then onto the fishing boat. "Apparently the rope was spotted last year but was too big for anyone to remove" Mr Green said. "This rope will have been slowly breaking down in the sun and shedding tiny bits of micro fibre into the sea for animals to ingest. Well not anymore," he added.